Juno-winning Canadian rapper Shadrach Kabango, better known as Shad, is q's new full time host. Juno-winning Canadian rapper Shadrach Kabango — better known as Shad — has officially kicked off the new era of q. The 32-year-old musician is well known in both Canada and the U.S. for his wit, humour and often philosophical lyrics. In 2011, he beat out Drake to win the Juno for Rap Recording of the Year. CBC fans will also recognize him as the winning book champion of Canada Reads 2012, when he successfully persuaded Canada that Something Fierce — Carmen Aguirre's memoir about becoming a political radical in Pinochet's Chile — should be at the top of everyone's reading list. 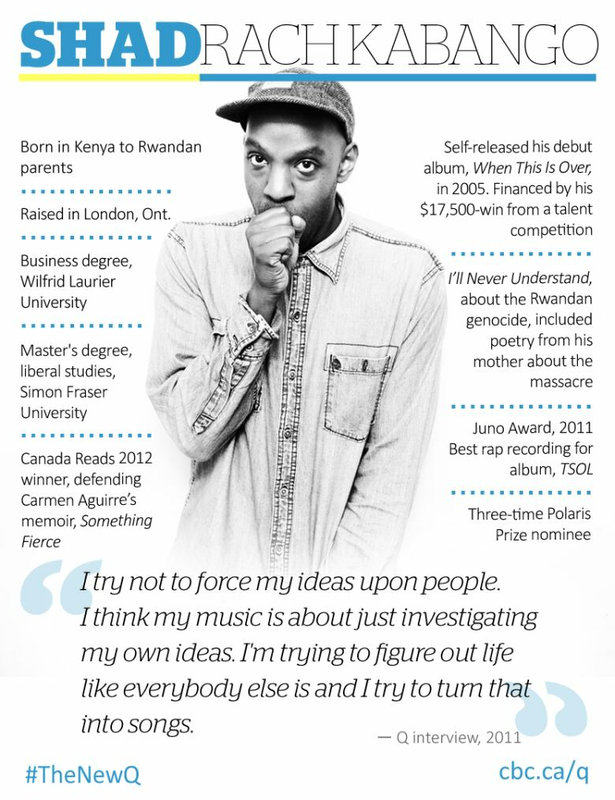 Born in Kenya to Rwandan parents, Shad was raised in London, Ont. He has earned a business degree from Wilfrid Laurier University and a master's degree in liberal studies from Simon Fraser University.